WACO, Texas -- No. 10 Texas Men's Tennis (19-5) advanced to the Big 12 Men's Tennis Championship semifinals by defeating No. 17 Texas Tech, 4-1, on Friday morning. The match was moved to Baylor's indoor courts due to rain and started at 8:30 a.m.
With the move indoors, the order of play for singles and doubles competition flipped. The singles matches played first with doubles acting as the deciding point, if necessary. But Texas was able to clinch the match in singles competition with wins from No. 4 Søren Hess-Olesen, No. 41 Lloyd Glasspool,George Goldhoff, and Clement Homs. Goldhoff clinched the team win for the Longhorns by defeating No. 114 Jolan Cailleau, 3-6, 6-2, 6-4, on court four. "I saw a lot of fight and determination today," Head Coach Michael Center said. "I wanted to see us compete at all six spots, and I saw that today. Texas Tech made a great run at us, but I was really pleased to see the final push that we made at the end to clinch the match." Texas and Texas Tech (18-8) played four three-set matches and two tiebreakers. Friday's Longhorn victory is the eighth over a top-25 opponent this season and gives Texas its 17th appearance in the Big 12 Championship semifinals in the last 19 seasons. UT will face Oklahoma on Saturday. The top-ranked Sooners received a first-round bye as the No. 1 seed in the tournament. Three-time All-American Søren Hess-Olesen found himself with a rare 2-5 deficit in the first set against Hugo Dojas, but closed the set with two service breaks for a 7-5 win. He went on to take the second set, 6-2. Fourth-ranked Hess-Olesen is now 18-3 in dual match play and 28-5 overall this season. Clement Homs cruised to a 6-2 first-set win and closed a back-and-forth second set by winning a tiebreaker, 7-6(7-3). Homs improves to 7-1 this season, including a 5-0 mark at No. 6 singles. Adrien Berkowicz started strong with a quick 6-1 win in the first set, but Alex Sendegeya swung momentum by breaking serve to take a 5-4 lead in the second set and eventually giving Texas Tech its lone point of the day. Lloyd Glasspool improved to 12-3 during dual match play with a three-set victory over No. 32 Felipe Soares, who has played at No. 1 singles for Tech for the majority of the season. 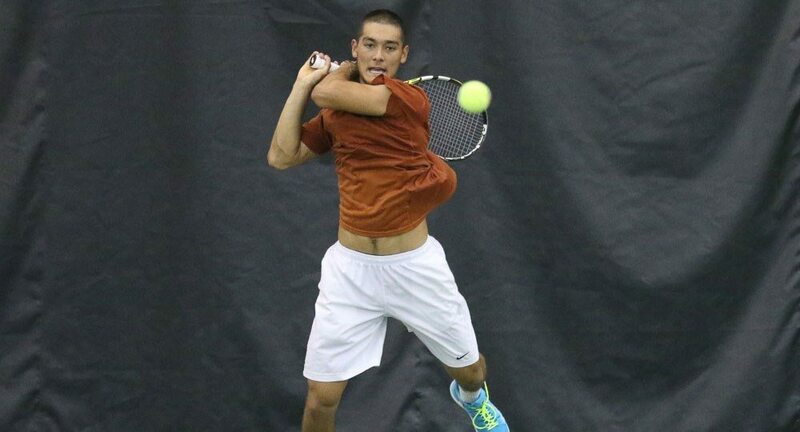 The only Longhorn not to win his first set ended up clinching the team match for Texas. George Goldhoff found his groove late in the match to earn this first win over a ranked opponent this year, defeating Texas Tech's 114th-ranked Jolan Cailleau, 3-6, 6-2, 6-4. "I started figuring things out as the match went on," Goldhoff said. "I was doing the right things, but I wasn't executing. When I finally executed, I really started to tire him out. He's a good player -- he's not going to give you anything. I'm just happy to step-up help the team." Nick Naumann was up a break in the third set when the team match was clinched.